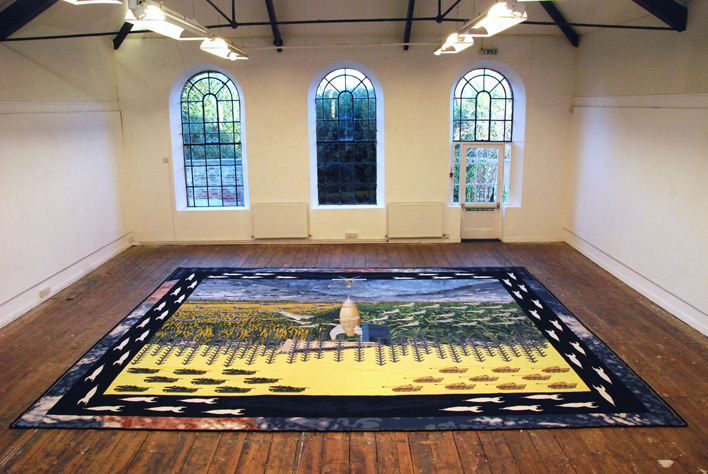 Carlos Noronha Feio, ‘3, 2, 1, 0 A A and away 1, 2..’, Tapete de Arraiolos, 5×6 meters, Wool, 2011, Courtesy the artist. London-based artist Carlos Noronha Feio (b.1981, Lisbon) is currently presenting his collection of alternative currencies in the Small Collections Room at Nottingham Contemporary. This exhibition – Matter of Trust – runs through to 15 June 2014 and is curated by Emma Moore. Feio is also the curator of The Mews Project in Whitechapel and is currently completing his PhD at the Royal College of Art, London. Widely exhibited both in the United Kingdom and abroad, he also recently participated on a group show Accumulation, Displacement, Deletion, Rearrangement, and Insistence with Nástio Mosquito and Richard Parry at Narrative Gallery, London. Work by Feio is included in Michael Petry’s book Nature Morte: Contemporary Artists Reinvigorate the Still Life Tradition, published by Thames & Hudson (2013). The work then is not about being an other or not an other it’s just pure relation. I began to think about Universim in relation to a specific space: the Portuguese National Pantheon in Lisbon. The Pantheon is associated with national sentiments which were very strong in Portugal in the twentieth century with its history of fascist dictatorships. The building, which has a complex history, was originally built to be a church: The Church of Santa Engrácia. The building work which took place over four centuries was only completed in the latter half of the twentieth century. It is made from marble and stones from different places from around the world. At the same time it was supposed to symbolise this national identity. It’s interesting how this building – the object of a building – represented, in its construction, a multitude of peoples and cultures. In making ‘Universim’, my intervention in this space, I began to search for sounds. Why sound in particular? What are the particular capacities of sound, and how does it function as a critical strategy? Because of the resonance of the space. Because of the way that sound fills the space and interacts with it. The way that it bounces back. The Pantheon is like St Paul’s Cathedral. It’s a gigantic stone dome with all the resonance that comes with it. Sound becomes a very important factor when you are in the building. When you walk your steps resonate. There is a sense of power associated with the history of the Catholic Church. The art interacts with the building: it is one of the devices through which ideology was used to control the population. I started searching for sounds that related to the cultures that could be symbolised by the building. I also took sounds from cultures that I am personally interested in. So it becomes a transnational space instead of just a National Pavilion; a Pantheon. There are all kinds of sounds that I chose because they just happened to be of significance to me. There are also working men’s songs, songs to do with community. There is a mix of sounds; compiled or recorded or downloaded from the Internet. I think sound is interesting as a strategy in that it inhabits the territory of affect, and the sensations to do with emotion, memory, feeling (in a very immediate way). Sound has the capacity to resist containment: it echoes and can travel beyond the the parameters set by visual images in their frames or, architecturally, or spatially speaking, the imagined borders of built structures and environments. Sound is intangible and ephemeral: we cannot touch or see it, but we hear and feel it. How we listen and what we hear is contingent on our own subjectivity. What did you find so compelling about the Afghan war-rugs, the departure point for ‘3, 2, 1, 0 A A and away 1, 2..’? I am especially interested in how you mobilise self/other relations, and how preoccupied you are with this construction in the process of researching and conceptualising work. More precisely work that engages cultural and geographical contexts outside of your own (or what are assumed to be outside). I first saw an Afghan war-rug here in London, near Brick Lane: the rug was quite rotten but it was beautiful. I then began to research the rugs because I was so fascinated by them. As I was researching I started reflecting on post-colonial discourses. I began to feel anxious about myself as a white European working on things that relate to the other. I decided that I needed to build an argument, a basis for doing so. I began to think about what is called my cultural identity. What people might call my cultural identity as a person born in Portugal. It struck me that even though Portuguese or any identity is constructed you are still brought up in a culture. You can resist it but it is part of you. Anyone in Portugal knows about the existence of a specific kind of rug from Arriaolos a tiny town about 100km away from Lisbon. This is an iconic product from the culture that I come from. I thought that what I could do is assimilate the aesthetics from one rug and the techniques of the other. This would be a straightforward crossover but I wasn’t very comfortable with this idea. And so I began to investigate further. There are points of connection between the Portuguese and Afghan rugs. The Arriaolos rugs have historical connections to Berber/Arab Muslim cultures that inhabited this specific region in Portugal for at least 1000 years. I then began to be interested in ideas of trade. I began thinking that the rugs are iconic products from Arriaolos and Afghanistan in terms of culture, and trade. But if you explore their history – although they are iconic to their specific culture – there are historical and cultural points of connection between them. Traditions of rug-making were maintained, they kept on being produced across centuries and traditions of rug-making circulated through trade and migration. But the meanings of the rugs might shift contingent on political developments. A product, in this case, a rug and more specifically the Afghan war-rug, ends up being ideological and politicised within a particular geographical area. I didn’t want to just assimilate the aesthetics but I wanted to reflect on the histories of rug-making I had been researching. So I created a sentence, trying to reflect on the history of the rugs. The sentence, which all the rugs relate to, is: ‘if we found a new world what could we export there that would represent us as a whole’. I usually used images associated with space travel. I was thinking of histories such as those to do with Portuguese discoveries and the imposition of western values onto people that have their own forms of civilisation. But I am also interested in post-colonial discourse and my subjective relationship to it. Within this discourse I am described as a white, western man: both my difference and the otherness of the people situated in opposition to me are locked into this language where difference is perpetuated. My personal philosophy is that politics and a related critical relationship to difference begins with the self. This is for me, one of the most important aspects of what is called the post-colonial. When Frantz Fanon wrote Black Skin White Masks (Peau Noire, Masques Blancs, 1952) he wrote from the foundations of his own lived experience. Race, for him, was no theoretical abstraction, removed and detached from life. He wrote from the particular perspective of France as colonial power, and Martinique and Algeria. Race is an important issue for me. You have to work hard at self-reflexivity all the time. On ‘writing in relation’ I want to avoid selecting artists because they are male, female, black, white, European, African and so forth. I am interested in artists who explore questions of social and political importance, and work in a critical, self-reflexive way. It is not about where artists come from or where they were born but about the artists as human beings exploring current issues of importance to the world we live in today. What are the particular capacities of art as it enters history, society, politics? 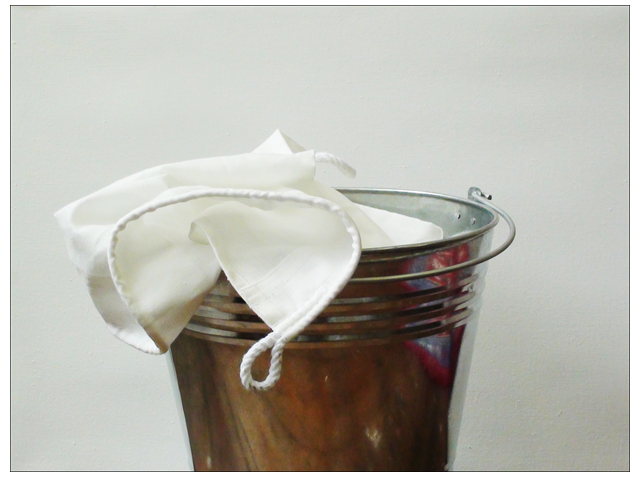 In ‘The Flag: Instruction Manual #2’ you perform an action: the washing of a flag; which appears pristinely white. I am interested in the whiteness of this flag, and in the detachment you perform, as you are interested in dialogue: your strategy of mediated performance is interesting. The action of washing the flag is not of my own conception. I assimilated it from several places. The most famous of the washing flags movements happened in South America in Peru, in Lima, protesting the authoritarian presidency of Alberto Fujimori (1990-2000). An important source, for my project, its conceptual core, came from the protest action ‘Lava la bandera’ (Wash the flag) by the art collective Colectivo Sociedad Civil. I also drew from the socialist American politician Norman Thomas: his call for an alternative to the burning of the flag during the Vietnam War, a silent (non- violent) protest – a washing of the flag. I also thought about other forms of silent protest in South America. Such as the protests staged by the Madres de Plazo de Mayo (or Mothers of May Square), for their disappeared children, in Argentina, during the dictatorship’s Dirty War (1976-1983). The ideas that inform this work are to do with assimilation, the creation of an aseptic product and then the dissemination of that product. The dissemination is not through imposing my perspective on the spectator. It takes place as a performance over the Internet in dialogue with curators and artists in other geographical locations. They make curatorial decisions and engage in a conversation with me about the work, their response to it. What the spectator or the public will ultimately see is not just a westerner’s imposition but a negotiated position between artist and local interlocutors. The work then is not about being an other or not an other it’s just pure relation. I find this fascinating. It’s not just about pure relation it’s about reflecting on questions and tensions or ambiguities that might emerge. I notice, in the way that you speak about your work, and your process, that you are continuously resisting ideas about territory, nations, borders, national and cultural identities. There is something that compels you to resist any form of containment, or categorisation whatsoever. You return to questions pertaining to post-colonial discourses that sought to theorise difference and the traumatic relations of self and other engendered by the colonial experience. But this troubles you. You do not see yourself in the constructed image of the white, western man. I personally am deeply affected by my experience of apartheid South Africa, and its legacy today. The way in which it produced identities and cultures out of a racist ideology which had visible, concrete impacts on everyday life was so violent and utterly dehumanising. I think this has to do with family and life experience. At the same time, and this is a very old-fashioned term, and many are against it, it has to do with humanism. Many rally against humanism. The whole notion of nation-states are just about control and containing populations and exerting power over them. I separate family history from the history of the state. I am blonde and blue-eyed. My parents are blonde and blue eyed. One of the first questions people ask is: ‘Where are you from? I say: ‘Portugal’. They say: ‘Oh really, you don’t look Portuguese’. I say: ‘Yes, I was born there’. They say: ‘But your parents are not born there? I then begin to enjoy myself and say: ‘No. They were born in Africa’. There is such a stereotype too about what you would look like if you are born in Africa. Africa is not homogeneous and neither are the people who are born there and live on the continent. My parents were both born in Angola. My grandfather founded a hospital there. People then say: ‘But your parents were not born in Africa?’ Then I respond: Part of my mother’s family comes from Italy. Another part from Portugal. And another from North Africa, a Jewish Rabbi. On my father’s side my grandmother comes from Cape Verde where her family has resided for hundreds of years’. There are all these different histories and I can select any particular route and it will lead me to a narrative that resists homogeneity and takes me to many countries. What does it take to belong to a place: if you are born in Switzerland, of parents who are not Swiss-born, you are not Swiss. If your family of European origin has lived in Africa for 500 years are you African? ‘If we found a new world what could we export there that would represent us as a whole’. I can relate to much of what you describe. And you also emerge out of a country – Portugal – with its own context of authoritarianism and colonialism. I am of the view that you always have to bring race into the frame when you are speaking about the African continent and the violence of the colonial experience; the traumatic residues of which still remain today. I am thinking about the historical complicity of Europeans in the history of race – as it relates to the colonial encounter. Of course, the idea of the European as a homogeneous uncomplicated whole is as problematic as a homogeneous, uncomplicated African. In apartheid South Africa, which is still very recent, the state produced human relations that were determined by race. Race and the power relations and abuses it engendered plays itself out in everyday life. Race was present right from the beginning of the colonial encounter: the construction of selves and others: civilised/savage; black/white and so on. While we have been having our conversations, I have been writing about the Voortrekker Monument in South Africa. It has played a central role in the state-sanctioned formation of Afrikaner identity. It is a repository for traditional values centred on God, Land, Family. I am looking at a South African video artist, Minnette Vári who enters into a disruptive, critical dialogue with this monument, she is half Afrikaans and half Hungarian. I am writing this text also as a mixed heritage subject, half Afrikaans, half from the Indian Ocean. Already our subjectivities call a state-sanctioned identity into question. I have been going through historical documents published at the inauguration of this Monument and it expresses the most unambiguous racism. Nobody whose history exists in relation to white settler or colonial culture is untainted by racism. You can’t pretend that this doesn’t exist. But my own fractured post post-colonial identity is always resisting racism, violence of any kind and the authoritarian containment of identity. Perhaps this is where I agree with you about humanism. But not humanism in the sense of the authoritative voice of the mythic white, Christian, man. I am still working out my position on this. I am interested in the idea that we can transform ourselves and in dialogue with others; often the dialogue is disruptive and emotionally charged and I think this is important. The idea of humanism is present in the work of post-colonial scholars. This is interesting. Fanon talks about a ‘new humanism’, for example, in Black Skin White Masks. If you are aware of these things change can only come about slowly and through self-awareness. You have to start changing behaviour in yourself. It is about being attentive to language and expressions you use. Interview/Conversation edited from the first of an ongoing series of dialogues with Carlos Noronha Feio. This text informed an ‘in conversation’ panel ‘Matter of Relation’ at the Royal College of Art, 13 March 2014. Fanon, F. Black Skin, White Masks. New York: Grove Press, 1967, pp.9-10 and p. 134. Originally published in French under the title Peau Noire, Masques Blancs, Paris: Editions Du Seuil, 1952. This entry was posted in Conversation, Interview, Public Presentations and tagged Carlos Noronha Feio, Frantz Fanon, Geography, History, Identity, Nation, Performance, Place, Portugal, Race. Bookmark the permalink.